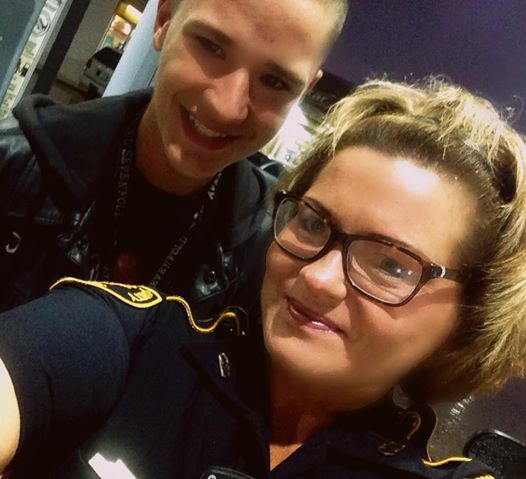 Stranger Asks Texas Deputy If He Can Stand Behind Her While She Pumps Gas. Deputy Asks ‘Why?’ Here’s the Answer She Gets. Submitted by Quest-News-Serv... on Mon, 09/07/2015 - 15:34. (STAND BEHIND IN FRONT SIDES ALL POLICE) It was a very early — and very rainy — Thursday morning when Tommi Jones Kelley pulled into a Texas gas station to fill her tank. A Harris County deputy constable, Kelley was in uniform — and the vehicle she was operating was her patrol car. Exactly the scenario her fellow officer Darren Goforth was in when he was shot to death late last month. Soon enough Kelley couldn’t help noticing that a teenager she didn’t know was standing right behind her. Then he asked a question. “Ma’am, do you mind if I stand here behind you while you get your gas?” Kelly recalled on her Facebook page. “To make sure you stay safe,” he replied. Then he walked away and began to enter the passenger side of a car, and Kelley had to know. New Images Reveal Nuclear Fuel Rack Exposed to Air in Japan, BREAKING..FUKASHIMA UPDATE! !